The year 2018 is coming to a close. Time for new ThinkPad laptops: With the ThinkPad E490 and the ThinkPad E590, the first models of the upcoming generation have surfaced on sites of Korean registration-offices. Many laptop lines are roughly updated once a year. Lenovo ThinkPads for example are traditionally revised at the start of a new year, though the more affordable ThinkPads of the E series are often updated earlier than their more expensive counterparts. As the CES 2019 is happening in less than two months in Las Vegas, it is almost time for a new ThinkPad generation. Following the existing naming-scheme, the upcoming models should be named ThinkPad T490, ThinkPad X290 and ThinkPad T490s. While there are no traces of these models to be found online (yet), the cheaper E series models ThinkPad E490 and ThinkPad E590 have showed up at the Korean registration-office. There are no pictures or specifications of those new models yet, though the registration does allow one to draw some conclusions; the successors of the popular models ThinkPad E480 and ThinkPad E580 are listed with their internal registration-numbers. 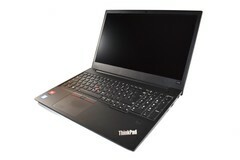 The ThinkPad E490 for example has the registration-number "TP00094D" and the ThinkPad E590 has the number "TP00095C". These numbers may seem empty of meaning, but the E480 had the number "TP00094A" while the E580 was registered under "TP00095A" – typically, completely new designs also get completely new registration numbers. This leads to the conclusion that both models are likely just small updates of their predecessors. We expect an announcement of the new ThinkPad models E490 and E590 in the near future. Most likely, Lenovo will utilize Whiskey-Lake processors in these new ThinkPads, such as the Intel Core i5-8265U.